A precious few believe L. Vaughan Spencer (L. Vo) is a tenth rate Tony Robbins, while everyone else knows he is ten times the Motivitality guru the big T. Ro could ever be. 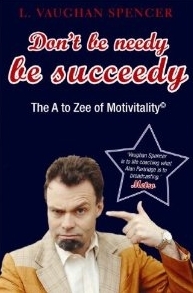 In his latest book, Don’t be Needy, be Succeedy, Spencer gives you everything you need to be a success; namely, the vocabulary. In a mere 248 pages (plus a bonus addendum), you will find the words successful people use, and once you sound like one of them, you will become one of them. After all, if it quacks like a duck, it is a duck. As an added bonus, this encyclopedic dictionary leaves off pronunciation clues because successful people do not waste their time with such things. There is one exception that proves the rule – While the book was published as an “A to Zed” in Britain, it has been released for the U. S. market as an “A to Zee,” because focus groups revealed that: 1) we suspect that “zed” is not a word, and 2) while everyone can pronounce the first letter of our alphabet, the large minority of us with ADHD never made it to the end. Think you are already a success? Add up your “no” answers. If the sum is zero or greater, then you are a failure. Need further proof? Successful people do not spend their time taking simple tests. Instead, they read L. Vo’s book and turn their Negatality into Positality. Don’t be Needy helps you hone your elevator speech with simple fill-in-the-blank forms: “I am great because…” “You should buy these because …” “Please go out with me because…” You will learn to re-write your resume, so as to cut through a hiring manager’s Emailistrom by turning your vacation on a tropical island into a “project in the developing world,” and by upgrading time spent in a Pub into “Hospitality Management” experience. Before you make a final decision on purchasing this book, stare at the blank space below and allow its subliminal messages sink deep into your subconscious. You must have this book. You have no choice but to buy this book. Your life will turn to poop if you do not buy this book. You will know when you have looked at this long enough because you will find yourself reaching for your credit card. Until this happens, keep staring. When your book arrives, put it in your lavatory. You need not complete it in a single sitting; but before you know it, you will purge yourself of the bad, and you will begin to hear your body tell you that your needs have been met, and it is time to become Succeedy. This book is the only book you will ever need (unless you are a Christian, in which case you also need a Bible). One guy I heard about. Consisting of 2 printed pages and 9 blank ones for your notes (if you include the inside of the back cover). NOTE: Whatever you do, don’t believe those guys over at No Shortage of Work who think this guy’s real name is Neal Mullarky. They are full of malarky. Whatever you do, do not listen to their interview of Neal. Author Brooke AllenPosted on June 11, 2010 Categories Resumes, Self Help, Success3 Comments on Permalink: L. Vo.